Every day, minute by minute, we are in a battle. Our very lives, and the lives of our families, are a war zone. There is no need to fear our enemy, but an awareness of the battle at hand is much needed! Armed with the truth of God’s Word and the power of the Holy Spirit, there is much to be accomplished in our war rooms! We’ve being given the armor of God and now we must pick it up and use it! The amazing movie War Room releases this week and if you’ve not seen it, I highly encourage you to do so. 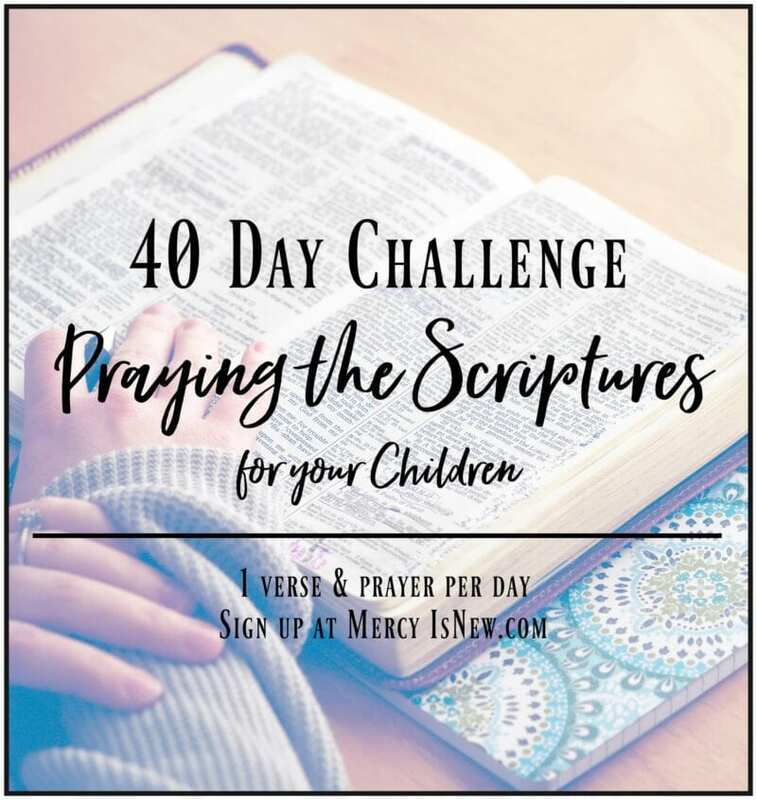 You will be so inspired and challenged in your prayer life! Sounds so simple, yet if we don’t renew our minds with the truth of God’s love for us, sometimes, when we look around us at all that is happening the world and in our lives, we might start to doubt. When God sent Jesus to be born in a stable in a town called Bethlehem, He did so with the cross in mind. Jesus was born to die. His blood gives us forgiveness, redemption and makes our relationship with God right again. Sometimes those words are hard to believe. But YOU were CHOSEN by the God of the universe! He created you, you are fearfully and wonderfully made and He chose you, before the foundation of the world, to be His child. His beloved. 4. God’s Word is a lamp to my feet. So often we worry, we wonder, we ask for wisdom…and yet God has given us the precious gift of His Word. How many times have we taken this gift for granted? 5. We’ve been given armor. Like God’s Word, we’ve been given tools, weapons, to aid us in the battles we face! We have been commanded to be strong IN THE LORD! How do we do this? With the armor of God! 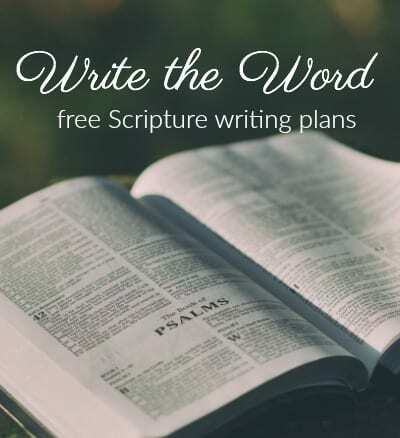 We have been given truth in God’s Word, the righteousness of Jesus, readiness with which to speak the gospel, a shield of faith, the helmet of salvation, and the sword of the Spirit. We have to learn to use them, pick them up and stand firm in the Lord and in His mighty power. 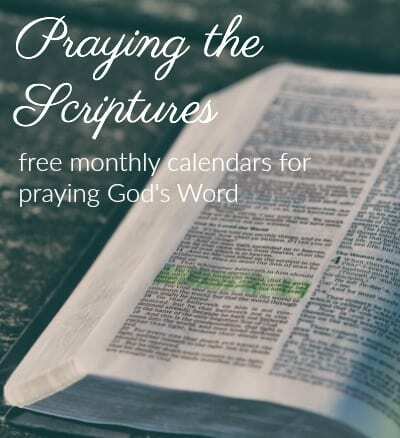 Read more about praying the armor of God, too! 6. The Holy Spirit intercedes for me. Sometimes we don’t have the words. This is why I began praying the Scriptures. But, it is so encouraging to me to remember that my Heavenly Father provided the Holy Spirit who lives in me, brings comfort to me AND intercedes for me according to the will of God! 7. He who is in me is greater than he who is in the world. This is such a powerful truth. The GOD that is in us is GREATER THAN the enemy that is in the world! 8. The Lord is my help. So often we go to others first when we are worried or upset. What if we started taking our problems to God first? What if we spent more time praying about things than trying to solve them on our own? I am so guilty of looking for the FIX to my issues. I want to be better about going to THE ONE who may or may not fix the problem, but CAN give me PEACE through it all! 9. Praise silences the enemy. When I can’t get the fears out of my head, when my worries threaten to take over my day, when the negative outweigh the positive, it is time to PRAISE GOD. When we praise God for who He is, the enemy flees! We have to be intentional to battle the enemy. We must FIGHT for our joy. Choosing joy and being intentional in our strategies has to take priority in our lives. Go turn some praise music on! Start counting your blessings, write them down, and tell God thank-you. 10. God is working it all out for my good. 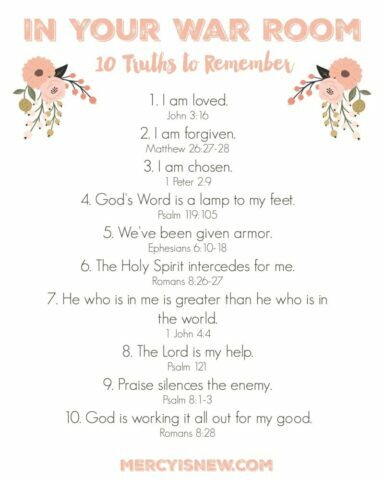 I hope this simple printable will serve as a reminder of these truths that we need to preach to ourselves daily!! Print it off and tape it to the fridge or your bathroom mirror! I pray they are an encouragement to you!